Guttenberg Industries, Inc. Completes $2+ Million Expansion - Guttenberg Industries, Inc.
Garnavillo, Iowa (February 10, 2017) –The late 2016 announcement by Guttenberg Industries, Inc. (GII) of its recent planned expansion has already come to a successful conclusion. The $1 million investment over the past few months was just a portion of the overall investment and the result of 20% sales growth for the Clayton County, Iowa manufacturer in 2016. Guttenberg Industries invested signif icantly in equipment, building, and employees throughout 2016. 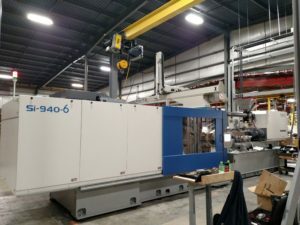 During the past year the company invested nearly $2 million in equipment and construction, including a 385-ton Niigata injection press installed in September, a 940-ton Toyo injection press installed in January 2017. 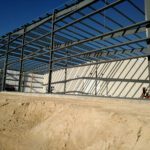 A building expansion that included 12,000 square feet of additional warehouse space and a new 15,000 square foot parking lot capped the latest developments. The parking lot was especially indicative of the company’s growth as employment during the past four months has grown to nearly 150 from just less than 100 only 12 months ago. The company also reevaluated health insurance options in 2016, seemingly choosing a trend counter to most companies..
“We now offer employees the option of three different levels of coverage. We also completely revamped our dental insurance and are now offering vision insurance as well,” says Deb Moser, Corporate Treasurer and Secretary. 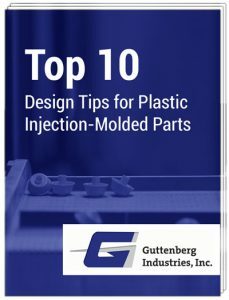 Overall, 2016 was a record-breaking for Guttenberg Industries, Inc. Company sales in 2016 were approximately $20 million, illustrative of a sales growth of 20 percent over calendar year 2015. A change in world markets is also having an impact. There was also a dual benefit for adding the warehouse space. Moser added that area residents are usually surprised to here that we not only do business in China, but that we have a regular presence there.